Sol i ombra (Sun and Shade, 1988) is the name covering two works by the north-American artist Beverly Pepper (b. 1922). 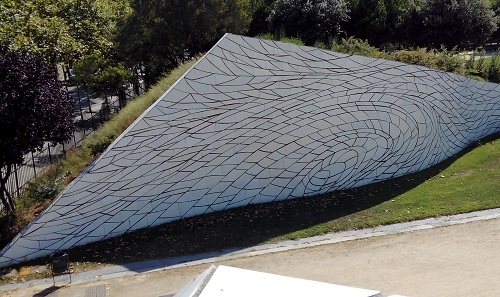 Cel Caigut (Fallen Sky) and Espiral arbrada (Planted Spiral) transform the Parc de l’Estació del Nord into a unique landscaped environment. 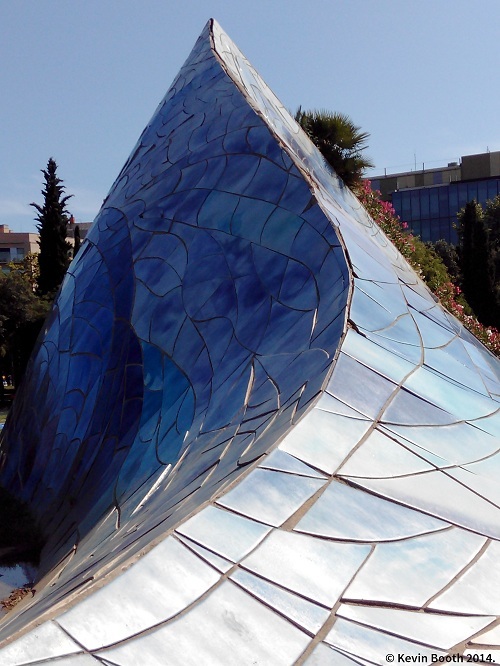 This installation is a rare Barcelona example of “land art”—a concept originating in the late sixties in reaction to the rampant commercialism of the art world. Cel Caigut is the most immediately visually impressive of the two pieces, the first work you’ll come across (unless entering from the direction of c. Marina). 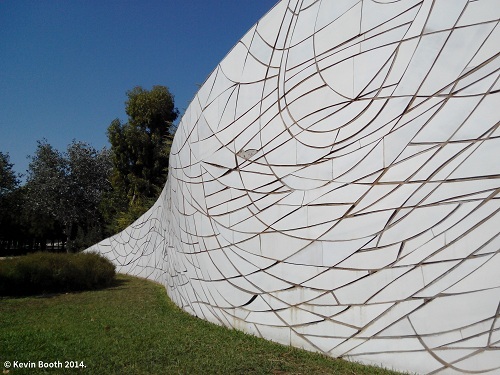 It is essentially a huge earthworks clad in ceramic tile—a homage to Gaudi’s trencadís style—that transforms the landscape. This is a total environment, one that invites locals to use and clamber over its forms, arranged like a benevolent sleeping dragon. 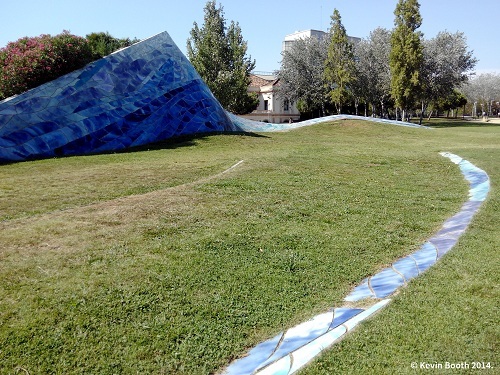 The sweeping ceramic curves embedded within the grass achieve a rare harmony with the Mediterranean architecture of the adjacent Estació del Nord building. In contrast, Espiral arbrada, a more discreet installation towards the rear of the park, nevertheless references and works in tandem with its more extrovert partner. 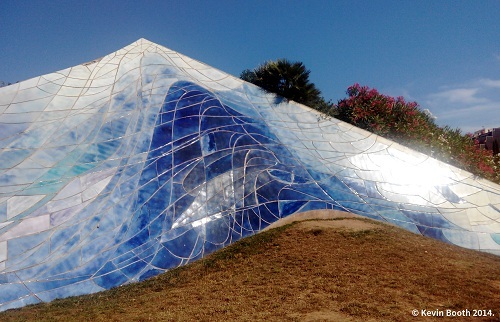 If Cel caigut is sun, Espiral arbrada communicates the idea of shade. This wide ceramic spiral, planted with linden trees, creates an atmosphere of peace and tranquillity that is far removed from the city’s bustle. The space breathes a mystical and invigorating stillness, which the iron totems spaced throughout the park seem to reinforce. What takes this installation beyond the mere idea of sculptures in a park is that all the vegetation and even the shaping of the earth have been chosen to accentuate the sculpture. 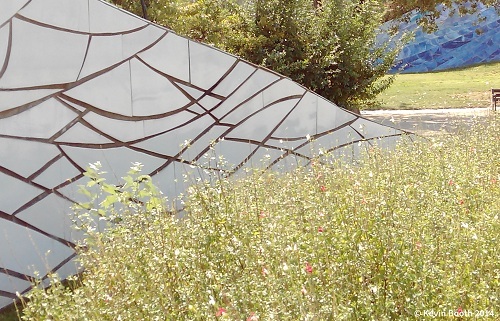 So the species of trees, such as umbrella pines and black poplars flanking Cel caigut, linden trees on the Espiral arbrada, but also white and Canadian poplars, are all there to accompany the sculpture, not the reverse. Even the park’s modular, semi-circular concrete benches contribute to the plastic experience. 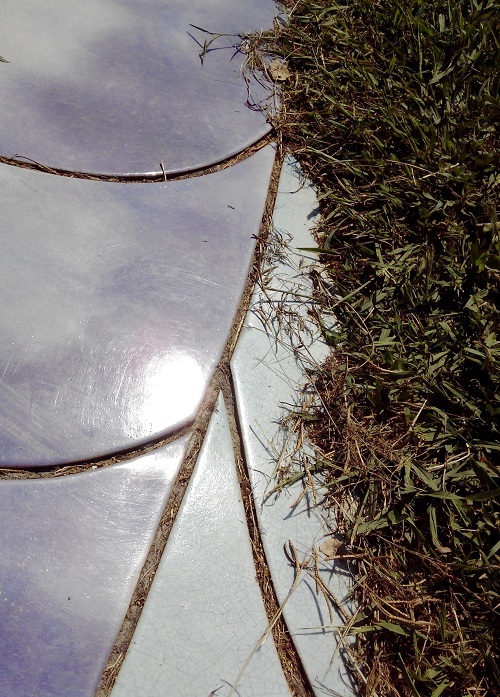 A huge earthworks clad in ceramic tile—a homage to Gaudi’s trencadís style—transforms the landscape. Pepper claims that her work “offers a place for reflection and contemplative thought within the context of active urban environments”. 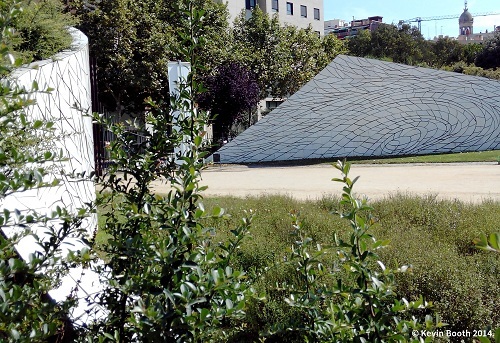 It is one of my favourite parks in Barcelona. 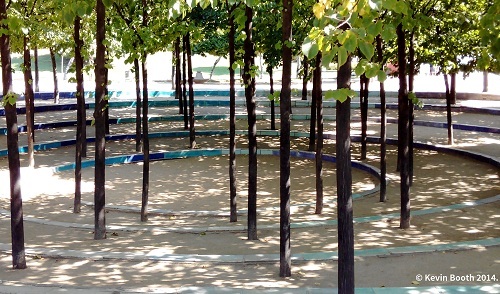 Sol i ombra: Cel Caigut and Espiral arbrada (1988) by Beverly Pepper at the Parc de l’Estació del Nord, c. Nàpols, 42.